India's Chief of Air Staff Air Chief Marshal BS Dhanoa called on Sri Lankan Prime Minister Ranil Wickremesinghe in Colombo and held discussions on matters of bilateral importance, according to Sri Lanka Air Force. Defence Ministry Secretary Kapila Waidyaratne at the Temple tress, official residence of the prime minister. During the meeting between Wickremesinghe and Air Chief Marshal Dhanoa, matters of bilateral importance and mutual relevance were discussed, the Sri Lanka Airforce said. Ahead of the IAF chief's visit, India's defence ministry had said that the trip would provide impetus towards increasing defence co-operation between the two air forces and pave the way for greater interaction in the future. "This would also strengthen relationships, enable engagement in productive exchanges and promote understanding of joint issues and challenges," it had said. 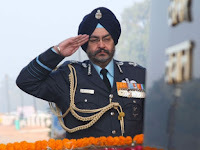 Air Chief Marshal Dhanoa is on a four-day visit to Sri Lanka in which he will deliberate with top brass of Sri Lanka's defence establishment on issues relating to regional security. During the visit, the IAF chief would also review the commissioning and passing out parade of the Sri Lanka Air Force Academy on 14 December.